Long gone are the days of plain or solid coloured glass kitchen splashbacks. 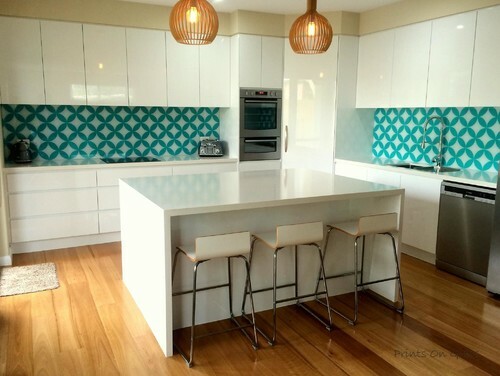 Trend setting homes around Melbourne are embracing a new technology that enables them to customise their kitchen, bathroom, home office and even outdoor entertaining area splashbacks like never before; printed glass splashbacks. Whether you’re a fan of picturesque getaway destinations, gardening or flowing decorative patterns, with a printed glass splashback you can now truly decorate your interior to reflect your unique style and personality. Homeowners Victoria wide are quickly catching on to this new trend to give their homes a modern, fashionable look. And the possibilities are truly endless. Can any image be used? You choose an image that you’ll love for years to come. Because depending on the dimensions of your glass splashback, your image may need some tweaking or resizing to make sure it fits perfectly. A low or poor-quality image won’t stand up well to being resized, so select a photograph, pattern or image that is high resolution to avoid any issues. A wealth of high quality images can be found on popular stock sites such as Shutterstock or iStock. Alternatively, you can choose a favourite photo from a holiday or family outing. Which types of images work best for splashbacks? There’s no one right answer to this. In short? It depends on the dimensions of your splashback and your own taste in decorating. For splashbacks that run along an entire wall (or two): Landscape style images like beaches or meadows are excellent for lengthy splashbacks. Patterns may also work well, but make sure you’re not choosing something too bold that may make your kitchen look crowded and busy. For small square or rectangular splashbacks (usually behind your stove top or bathroom vanity): Patterns and bold colours work well here, as they will be very attractive but won’t dominate the entire space. And of course, be sure to choose an image that fits in with the colour schemes and design of the rest of your home! How is a printed glass splashback created? Your glass company will print your glass splashback for you. As soon as you have the image you want, contact them and they will provide you with a quote, which will vary according to your dimensions. After you accept the quote, your company will measure the glass for your splashback using specialised laser equipment for accuracy and will cut it using a robotic CNC machine. All edges of your splashback will then be polished and rounded and your desired image will be printed onto the glass. From the time that you accept your quote and make an initial deposit, you can expect to have your printed glass splashback in around 3-4 weeks. How long will the image last? This is the true beauty of printed glass splashbacks: Your image will last for years and years, meaning your design is essentially timeless. Protected by its glass surface, your image is safe and secure. Its vibrant colours won’t fade with the years and parts of the image won’t rub off or get damaged like surface-painted tiles or splashbacks. Discover the possibilities of customising your kitchen with a printed glass splashback today.